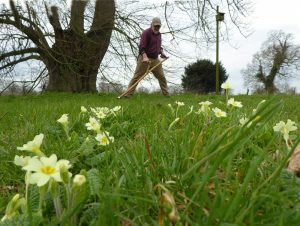 International Peening Day, on the first Sunday of April, is a perfect opportunity to prepare and test blades on newly awoken grass in the meadow in readiness for the coming season. This is a personal blog post account of International Peening Day 2018. It was indeed quite a personal event for me, falling as it did on April 1st, because not only was this IPD but is was also Easter day and … it was my birthday! (oh and April fools day). This is the first time that Easter Day as fallen on my birthday in my nearly 60 years, and I had a very nice birthday/Easter/IPD (thank you for asking). 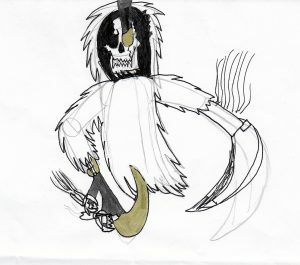 One of my foster children gave me this themed Birthday/Easter/IPD card he had drawn for me! I also had a surprise parcel arrive in the post which contained a sleek new Czech peening jig with a card saying “Happy Peening Day”. This jig is a vast improvement in quality and finish on those from our previous supplier. The fit of the caps on the guide post is so perfect the cap descends gracefully down cushioned by the escaping air. Sadly as a result I spent quite a bit of time just playing with it; reminded me a bit of the pleasure associated with [pointless] air damped cup holders in some cars, and posh kitchen unit drawers. With a new jig I of naturally needed a new peening pony to set it up on. Accordingly I spent part of IPD constructing one, especially as conditions for mowing in the meadow were not ideal. The new Czech jig performed well and with precision as I expected. The number 1 cap peened a distinct line 1mm wide and 4mm from the edge. The number 2 cap peened the very edge 1mm. This seemed to leave an unmarked zone between which made me wonder whether a third intermediate cap was needed? With the comparatively imprecise old jigs the work of the two caps overlapped more? 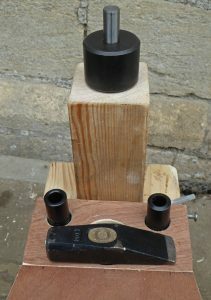 As it was a special occasion I then decided to christen my new jig/pony combination by repairing and peening a falci blade that I had damaged some 18 months ago and left at the back of the workshop waiting for a rainy day. Falci blades and I have a somewhat troubled relationship. They are smooth to mow with, and feel good, but I find are less forgiving of hidden stones or stumps. 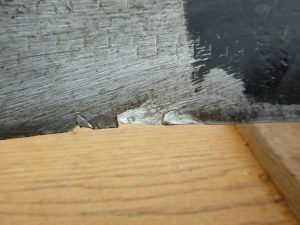 Damage from a ding tends to run as cracks back into the web rather than just fold back the peened edge (as with a fux blade). Anyhow, I managed to file back then jig peen the damaged area, followed by freehand edge peen to the full blade. The Falci blade only required gentle peening as the web is quite thin, and the steel yields and extends easily. Peening done there was time for some mowing practice in my meadow for myself and the small band of mowers who braved the weather to visit me on IPD . I normally do quite a bit of trimming in my wild flower meadow at this time of year as it helps maintain balance and diversity; this usually fits well with IPD. This year however with a late cold wet spring I had much less ‘surplus’ grass growth by 1st April. The growth of grass and yellow rattle in my meadow is delayed by at least a fortnight to three weeks so mowing postponed until the middle of the month. Really like this post. Looking forward to flexing the old scything muscles later in the year but first want to enjoy the flowers.